Today we misunderstand each other more than ever. One person’s ‘immigrant’ is a threat. Another’s is a displaced person seeking political asylum. For some ‘benefits ‘are rights. For others they are the domain of scroungers. Misunderstanding has consequences – and it happens because of the way language works. Terence Moore’s starting point in writing these ten linked Conversations is that John Locke’s ideas hold the key to our recurrent misunderstandings. But that key has for too long been buried in the least well-known Book (Book III ‘Of Words, or Language in General’) of Locke’s famous work ‘An Essay Concerning Human Understanding’. 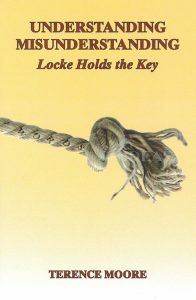 We, living in the 21st century, need to disinter Locke’s key and start to use it. Without the key misunderstanding will continue to be misunderstood. For Locke, on the other hand, meaning and related notions, denotation, connotation, misunderstanding, were the focus of his thoughts on the workings of language. More broadly Locke’s engagement with some modern thinkers allows the Conversations to range widely from happiness, morality and indoctrination to the manufacture of consent and Locke’s alleged empiricism. At the heart of Locke’s explanation of how we often don’t quite understand each other is an idea he calls ‘Secret Reference’, what we might call ‘acting as if’. Locke claims we ‘act as if’, or tacitly assume, the meanings of words for us are the same, or broadly similar to the meanings other have in mind. This assumption, this communal ‘acting as if’ is both useful and misleading. Useful because it kick-starts our efforts to communicate. Misleading because it presupposes words contain meanings which we all learn and acquire. But words don’t possess meanings, Locke says. ‘Words’, he writes, ‘are Sounds without Signification.’ Without meaning, that is, until they have been processed by individual minds. And individual minds differ. In his efforts to clarify his radical views on the nature of meaning Locke repeatedly returns to his favourite image of the links between words and meanings. This image is of the word as a knot tying together a bundle of ideas and feelings (add image from cover). We may well share the word but not share identical strands making up the bundle. A fertile seedbed for misunderstanding. Same word, differing set of strands therefore different meanings. Sometimes slightly different. Sometimes very different.